Jason Hartman talks with self-publishing guru Dan Poynter who spent eight years researching a labor of love. Realizing no publisher would be interested in a technical treatise on the parachute, he went directly to a printer and self-published. The orders poured in and he suddenly found he was a publisher himself. More at: http://www.speakingofwealth.com/category/podcast or on iTunes. In 1973, Dan became interested in a new aviation sport, couldn™ find a book on the subject so he sat down and wrote one. After four months of writing and intense research that took him from coast to coast, he delivered the manuscript to the printer. So far, Hang Gliding has sold over 130,000 copies-a best seller! For many years, Dan ran Para Publishing all by himself. In fact, he was often billed as the world™ largest one-person publishing company. As a one-man show, an author/publisher who handled all the writing, publishing and promotion, office management and shipping himself, Dan is in the best position to advise a first time self-publishing author who is on a limited budget. Today, Dan has staff, a number of products and services (books, reports, tapes, disks, seminars, etc.) and a large suite of offices with a 360 view of the mountains and the Pacific Ocean. Dan™ work for publishing was recognized by the Publishers Marketing Association when they gave him the Benjamin Franklin Award. He was given the Irwin Award for the best electronic promotion campaign by the Book Publicists of Southern California. He is a past vice-president of PMA. Dan Poynter™ seminars have been featured on CNN, his books have been pictured in The Wall Street Journal, and his story has been told in U.S. News & World Report. The media comes to him because he is the leading authority on book marketing, promoting and distributing. Dan was prompted to write The Self-Publishing Manual because so many publishers wanted to know his secret to selling so many books. Dan is one of the publishing industry™ most energetic, experienced and respected leaders. He lives in Santa Barbara. Dan founded Para Publishing in 1969 to collect, process, publish and disseminate critical safety information on parachute design and skydiving techniques. Initially in North Quincy, Massachusetts, it was moved to Santa Barbara in 1974. The company expanded into other books, tapes, reports, disks, seminars, speeches, consulting, etc. on other subjects. It published the first book on hang gliding, a circular book on Frisbee play, the first book on word processors, the first laser-typeset book, it was the first publisher to send galleys by modem, published the first book on speech recognition for writers and many other firsts. The company publishes several authors and most of Dan Poynter™ work. Jason: Welcome to the Speaking of Wealth show. This is your host Jason Hartman, and this is Episode#3. Today we’ve got a special treat. We’ve got self publishing guru expert. I am sure you’ve heard of him. I have been following his work for many years and that is Dan Poynter, and he is joining us from Santa Barbara, and he will be sharing some great tips on how to sell publisher book. We will be talking about the new electronic media, the Kindle, the iPad etcetera, and I think you will find this interview to be very valuable, lot of resources here, and a lot of good stuff, so we will be back with that in just a moment. Introduction: Now it’s your opportunity to get the financial freedom report. The financial freedom report provides financial self defense in uncertain times, and it’s your source for innovative forward thinking investment properties strategies, and advice. Get you newsletter subscription today. You get a digital download and even more. The price is only $197. Go to jasonhartman.com to get yours today. Jason: It’s my pleasure to welcome Dan Poynter to the show. I have been following his work for many, many years. And he runs a group called Para Publishing. Its parapublishing.com. You have probably heard of Dan because he is the undisputed guru, and the guy who has really revolutionized the self publishing industry. Dan, it’s a pleasure to speak with you today. Dan: Oh it’s a great pleasure on my part to be here. Thank you Jason. Jason: So tell us what’s going on in the industry? I mean talk about a changing industry. I discovered you may be 11 years ago when I published my first book, and I remember back then these publishers didn’t know where they were going, and they were concerned about protecting their turf and all of that, and nowadays with the Kindle, the iPad etcetera, etcetera things are really just changing so quickly. Dan: Oh these are exciting times Jason. And what we see in the book publishing industry is going to add an accelerated rate of change and the reason is they haven’t changed the way. The big New York publishers haven’t changed the way they are doing business since 1947. I was reading something to Seth Gordon wrote this morning. He says since 1907, so in other words they are playing catch-up in the accelerated pace, and they were resistant to change. You see all the big publishers know how to do is have your big manufactured. And they don’t do that. They send it to a printer, and they send your book out the book stores, that’s all they know how to do, and we are going vertical today. I mean just for example Amazon wants you to publish with them. They will be your publisher. They can be your printer. They can reproduce your audio, and of course they’ve got the big websites and the distribution. They do the shipping, so they are vertical. They take you right from the beginning, and they cover all the steps whereas the big New York publishers only cover the two steps. Dan: Oh absolutely and you can get your book on the bookstore. You simply use a distributor. I use National Book Network, the largest one and my books run all the bookstores that’s not a problem. Also something we discussed before we went on the air is in addition to the ebook you do need a pBook, a printed book because you need the printed well, people take you more seriously if you have a printed book. You see if you have an ebook, they think well, you wrote an article or something, but if you did an ebook people think it’s nice. If you have done a printed book, oh you are an author, and the word authority contains the word author, so you are in authority by definition. People hold books and authors on high esteem, so you have to have that printed book, and you have to send the printed book out for review, so bury in mind that eye balls have moved from print to online that’s why the newspapers and the magazines are downsizing, consolidating going out of business. The advertisers have put all their money into online promotion. We have to promote our books online, but we don’t spend money doing it. We spend review copies to anybody who has a blog on our subject. We send review copies to anybody who has got a website on our subject to anybody who contributes and answer his questions on forums and LISTSERV’s. These are the brand new models. These are the thought leaders. These are the people that make things happen, and people listen to them, and they do what they are told. So if you send them an ebook, a PDF, they will look at it and say oh Jason wrote a book, boom it’s gone. Dan: If you send them a printed book, they take it out of the bag they look at the front cover, they look at the back. They look inside, and then they put it on their shelf, and its still there communicating back constantly reminding them, and this thought leaders, this opinion models then are recommending your book to the people that worked down below them. Jason: There is definitely good advice. I am just wondering is there any easy way or systematic way to do that for example do you have a recommendation for a fulfillment service where they can hold a bunch of your books, you can click the link say send to this guy, send it to that blogger, send it to that person in the media, or is it just stick them in an envelop and send it off yourself. Dan: Well, I recommend that everybody handle their own fulfillment initially just as if you learn it, and that way when you go to buy service you know what you are getting for your money, and I will also say that I have never been overwhelmed. We all dream of going to the post office well that was the old days. You know in having the postmaster say oh, I am so glad. Here we have this mail stacks full of quarters for you. That was the old days when we go to the post office, but I have never been overwhelmed because the orders come in, spread out incrementally. However, yes there are fulfillment services out there and you want to make sure that you get the fulfillment services close to your printer so you are not paying a lot of trucking fees, and those _____ [0:06:03] services are listed in my book. You want to find one that is in the fulfillment business of shipping books so you know how to do that. They are not doing all kinds of products, and there are number of med specialized in that so they are listed in my book. Jason: So anymore on the industry there just so much I just want to kind of get that backdrop established before we get into more of the details of how to publish, how to promote etcetera. But you are definitely write about the pBook, the printed book, the good old printed copy no question. Dan: I would say what’s going on in the industry? The brick and mortar book stores are going out of business. There are about 1000 to 1100 independent stores left in 25 years ago. It was only independent stores, and they have been going out of business at the rate of 3 per week for years now. Then we have the chain stores like Borders, Barnes & Noble, Books-A-Million they are in deep, deep trouble. They are going to go out of business, and the reason is this brick and mortar stores are downtown, and their location, location, location is where the properties are expense. They cannot compete with an online store that’s got a warehouse selling the country. Look and see what people are doing. What’s happening with people? They go into a Borders or Barnes & Noble. They look at a store. They pick up their iPhone, they click on to Amazon, and they check the price and its 30% cheaper, and they hit the buy button, and they walk out, so Borders, Barnes & Noble the independent source are showcasing books for Amazon, and that’s the — what the star truth of that? Jason: Right they are just turning around and basically showcasing them for free actually so it’s kind of a bad deal for the brick and mortar person. Jason: But Barnes & Noble for example, do you think they have a good chance of sort of a comeback if you will with their ebook reader. I can’t what’s that called the Q or something? Dan: Well, they are literally — they got into the ebooks about a year and a half ago. That’s when they bought Fictionwise which is a very good ebook distribution company, and this year they came out with the nook, and they are trying but they are probably going to — well, they’ve already closed down all the Walden stores, and the Dalston stores the one that were smaller out on the suburbs, and now they are just concentrating on the super stores. And they are going to continue to run the numbers. They are business people, and they just might have to close those down because the future really is buying things online. I don’t know about you where I travel, and I hardly ever go into a store of any kind. I just go buy things online, and somebody delivers it. Jason: And I think that’s definitely true of everything, but clothing. And even clothing I buy online too a little bit, not as much, but no lines, massive selection, lower prices, and no sales tax, so. Dan: Well, you are absolutely right. Of course there is a difference between the way the men shop for clothes, and women shop for clothes. We find a pair of shoes we like. We go online, we order a couple of extra pair, and we have them banked in our closet. A woman would never do that. Dan: She got to go try it on and look at it, but I think for men that’s really the new way to shop. Jason: No question about it. So why would someone want to self publish versus going to a publisher that’s sort of the retail side of the book industry. Are there some big self publishing success stories that you want to share or what sort of constitutes even success in the world of publishing with the publisher and self publishing? Dan: Well, basically unless the publishers got some great connections and can sell four times the number of books you can, you don’t want to go with the publisher. The beginner publishers are in serious trouble. The New York publishing is both broken and broke. And I will tell you they are going to go out of business very quickly, and if you don’t think they can go from the top to the bottom overnight just remember General Motors. The big New York publishers the six of them are going to be replaced by Google, Amazon, Apple and may be barnesandnoble.com. They are going to be the new publishers, and its going to happen very quickly. The big publishers if they know what’s going on at all are scared to death. I mean just for example you publish with Kindle book today and Amazon gives you the royalties what’s that 70%? The publishers can’t compete with that. I mean just there is no way they can, can handle that. So the only time you want to go with the publishers if you go with the medium size one. Let me give you some numbers, six large publishers in New York, 3 to 400 medium sized publishers, 86,000 self publishers. Now, the medium sized publishers, and the self publishers specialize. They may just do travel books on islands in the South Pacific I mean very, very specific, so that means they are plugged into that market, and they are selling those books not just through bookstores, but if it’s a travel book or it would be to travel books and travel stores, and they have deals with the travel agencies, and they go to all of the travel conventions and you know they are on the travel websites, and they are all plugged in all specifically. Well, now the medium sized publisher is pretty good, so you want to go to a bookstore, go to Amazon, barnesandnoble.com, and look for books in your category, and find books as close to yours as possible, and see who publishes them, and if it’s a medium sized publisher you can go to their website and check it out, and see if things fit that might be a good way to go. The other choices however are the vanity presses, which are very bad, and self publishing and self publishing just means you do it yourself. You are going to make more money. You are going to get the press sooner, and you are going to keep control of your work. Jason: Dan can you distinguish for the listeners; I just don’t want to let you go on before you just make one distinction if you would. Lot of people don’t understand what a vanity publisher is and the other one they kind of don’t understand sometimes is what a subsidy publisher is. Can you just explain those? Dan: Vanity subsidy is never the same thing, and it’s really confusing. And of course this vanity press is called themselves self publishing companies because they are trying to capitalize on a recognized term. The only self publisher is the author, and nobody can be a self publishing company unless it’s the author. Now, the problem with this vanity presses is that they are very expensive. I had a lady come up to me recently with a book, and she said can you help me sell this? And I looked at it, and they had the name of the vanity publisher on the back. I said how much of these books costing you? She said $11 each. I said, but you haven’t sent out to me review copies. She said I can’t afford to send out review copies. Why would you pay $11 for something you could buy for less than $2? I mean when you are paying $11, you can’t afford to give a bookstore discount so that is not going to carry it. You can’t even afford it to send them out for the review copies because they are too expensive, and these vanity presses they have boiler rooms full of people calling authors everyday. They always have a deadline, and they just wear people down to get their money. Now, before you deal with anybody in the publishing industry and for that matter before you buy a car or have your house painted, do yourself a favor, make a Google search and the company name and the plus sign and scam, company name plus fraud, company name plus better business bureau, company name plus rip off. And if there were problems with the company you are going to read about it. You know I dealt with the pluming company just recently, and I went online, and checked them out, and there were no bad reports on them, and I put the company name plus fraud no bad reports, okay. They must be okay, but you — with these vanity presses you will read all kinds of horror stories. I mean the people are really upset out there. Some of have been sued, and of course that’s why you — the company name puts better business to you. And if you know anybody else who is thinking about going — who is writing a book and thinking about going with one out for another tell them to do it. You will be doing them a great, great favor. Jason: Yeah they are just taking advantage of people appealing to their ego. No question about it. So people should self publish. I definitely get the point of that because even a legitimate publisher I mean they don’t really offer any promotion, do they? Dan: No. Publishers don’t promote books. As a matter of fact they — the big publishers won’t even take you on unless you already have the following. They are only publishing celebrity’s people who do have the following as they are going to sell a certain number of books to the fans of that particular celebrity, but they won’t even take you on unless you can demonstrate that you are out there, and you are selling books yourself. Jason: So the way to go is self publishing. What are the steps? Dan: Well, first of all it’s much, much easier today. It’s far easier. It’s much faster, and the reason is computer and the internet. You can do all your research right at home. You’ve got access to the world’s largest library is called the internet. You don’t have to drive downtown to the library, and if you do, you will find the library doesn’t have what you want anyway, so all of the research could be done there. You can contact people through forums; LISTSERV’s to get more information. The LISTSERV is the cheapest consulting you can buy because it’s free, and you can ask any question. All this wonderful people will answer you, and I am talking about forums on your particular subject so for me it would be on at our books, or it would be on parachutes because those are my two areas. And then after a while you can, you are doing research on your book and you are focusing your message and you are thinking about reader, and after a while, you can start answering questions on this forums, this LISTSERV’s and you always sign your entry with your name, your coming book title, and your URL. You want to drive [unintelligible 0:14:34.9] back to your website. Now, when your book comes out, you have a whole bunch of people out there on your subject who know you, like you, and want to buy your book, so you are going to do a research online and you are also going to sell your books right back to those people online. I have a book. The title is Writing Non-Fiction. It shows you step-by-step how to take you are idea, and take it all the way through until its ready to publish, publish yourself, or send off to an agent or publisher. So the first step is the research part then you do your rough draft. You take all your material and just roughly get it into the computer, and put it into the binder, and see you can carry it around. Then you go to your second draft which is your content added where you cleaned it up, and there is the third draft is where you take each chapter, and you send it out to an at least four experts on that chapter people you don’t even know. And then you get feedback from them. I will you 10% of your really good up-to-date stuff comes from other people because you prompted them to read your 15 page chapter, and it gives them all ideas, and they start scratching things in the margin. Your last draft is the fourth draft that you will copy/edit that’s where you send it out to the picky English pro somebody will English it up for you. We all use editors. Well, we all should use editors and then you are ready. You’ve got it ready to go. Jason: Good. So one question on that last point you made about send it to an editor. How do you find a good editor? This is a very subjective world when it comes from writing. I mean you know good writing when you see that. Jason: You know bad writing when you see it. A lot of people say they are a writer yet. They couldn’t compose two sentences together and to have it be grammatically correct. How do you find an editor? Dan: And we all use editors and some people are — they know their subject, but they are not good writers, and may be English is their second language. It doesn’t matter. You get all the material done. Somebody else will clean it up. And even great writers use editors. Where do you find them? Well, on my website in the supplier section. I have got listed about 12 or 15 of them. You need to call up most of them, and the questions you ask is what do they charge? When they can fit into their schedule, and the most important thin have you ever worked on the book this category before? You want to find somebody who likes the subject. Somebody is excited about it, and somebody who can what bring ideas from previous works. You know Jason have you ever thought about this, and I read about this. Don’t worry. Have you ever thought about that and that so they are not just doing punctuation, grammar and style, but they are doing a little bit of content, giving feedback as well. Jason: I know that people tend to kind of buy things by the pound sometimes. Is there any feedback on the optimal size of a book, and by the way before you answer that I want to say thank you for writing and sending me this short book, Self Publishing Manual Volume 2 because I think a lot of books are a lot longer than they really need to be. What do you think about Size? Dan: First of all you need to go to a bookstore, go over to that shelf where your book is going to be, and look at the books that are — that will be right next to yours. You will find that books in different sections, different categories in the bookstore have a different look and feel and format and layout. For example all of the books there are five and a half, eight and a half. Well, don’t make your eight and a half by eleven its not going to fit on the shelf. You are going to find out if the majority of them are hardcover or are they soft cover, respect the category make your book look like it belongs there. It’s what people who are buying that kind of book are used to. Dan: Nobody use a computer book that’s going to last a long time. Jason: That’s true. It shouldn’t last longer than the computer yeah. Dan: It doesn’t very long. So you will find that cook books tend to be wider, and they are tall, so they are openly flat on the counter. Many travel books are tall and skinny have rounded corners, and are very lightweight papers so they can be slipped into a pocket or a pack. You want to respect the category so definitely go there. Jason: How many pages yeah? Dan: How many pages? Well, you want a number 144. I read to that. 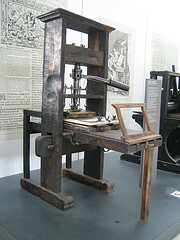 Dan: On many, many presses I am talking about book printing presses. They run a big sheet of paper, and they print 24 up and 24 down that’s 48 page total, and then its folded into what we called a signature. So we have to look at increments of 48, 48 would be a skinny book. 96 pages was just not across that magic 100 number. Its hard to charge a full price for a 96 page book, so the next increment would be 144. All my books for several years have been 144 pages including that one that you just mentioned Volume 2 the self publishing thing. Jason: I just looked at the last page, its 144 yeah. Dan: And that’s were all the printed pages. I mean that’s all of your front matter, your text and your back matter, so that’s very efficient. Now, if you want to add half of that 24 pages that can be done, but the most efficient — paper is the most expensive part of the book. Press runs are not inexpensive, and so really the most economical sizes are a 144. Jason: Saying that though Dan it’s kind of interesting because what if your idea is more than 144 pages or what if it’s less than that? I mean how do you really make it fit? Jason: Your endorsement things yeah. Dan: Title page, your copyright page or table of contents, your acknowledgements, your something about the author, your foreword, I mean you could have 10, 12, 13 pages right there. In the back of your book, you definitely want to have an appendix which would include your index. You must have an index. I mean there is people want that, and libraries wanted, and bookstores wanted. Jason: How do you do indexing? I’ve heard that libraries and academia will not take a book without an index. Any recommendations on how to do? Dan: You can do an index yourself very, very quickly. There are indexing program, but they — boy there are a lot of work. Jason: They don’t really work, do they? Dan: No you know your book because you wrote it. All you have to do is break their in Microsoft Word. You start skimming your own book, and you start typing in words, and page numbers, and you sort it, and auto sort it, and you keep on writing or, reading and adding more words and page numbers and auto sorting it. And you can do 144 page book for me it would take less than an hour for somebody the first time might certainly be no more than hour and a half. Jason: To do the index you mean? Dan: No if you get somebody else to do it. They don’t know the book. They have to read it very carefully, but you know where everything is. Jason: But speaking of which you said something that I just wanted to bring up because I know a lot of speakers are kind of busy. They are traveling, they are trying to get more gigs, and book more engagements, and they just want to hire a ghostwriter to write on the topic, talk to everybody about ghostwriters for a moment if you would, bad idea. Dan: That’s perfectly okay. You have the content, but may be you don’t have the time to do the writing. And you know I think Lee Iacocca wrote us two bestsellers by himself, do you? Jason: And I don’t think Donald Trump writes any of his. Dan: Well, and these celebrity books are very rarely written by the celebrity. I mean they — it’s just another product with their brand name on it. I have ghostwriters listed on my website in the supplier section. You hire them the same way you do an editor. How much do you charge one you could fit it in your schedule, and have you ever worked on my subject before? If you have a business book you don’t want to give it to somebody who thinks that business is _____[0:21:58.4] commercial? You know you want to give it to somebody who has done other business books, and just loves business. Somebody is going to wake up at 4:00 in the morning so excited here is he can’t wait to work on it. Now, the more you give them the better. And you can go through my writing non-fiction book and that shows you how to gather your material and lay it out in piles, one pile for each chapter. Again the more you can give them the better. You could just give them transcriptions of your speeches, and give them something very general and let them go with that. It’s going to take them a little bit longer, and I have to do a little bit more organization, but there is nothing wrong with turning something over to a writer. I often say do you like to do bookkeeping and I say what do you do with your bookkeeping? I hire it out. Well, with your writing, you can hire it out. It’s the same thing. There is nothing wrong with that. And you brought up professional speakers. Now, generally speaking professional speakers tend to be more gregarious, more outgoing, and more extroverted than writers like me. I am an introverted writer, so on the scale of 1 to 10, writers tend to be three or four. And many of the professional speakers are up around seven and eight. Salespeople tend to be 9s and 10s. So if I would have to ask people who they are? What’s this book about? Where do you want to go with it? And I try to determine where they are on that scale 1 to 10, and if they are terribly extroverted then I give them permission to get help or hire a writer. You don’t have to do that. Do what you do best, and hire all the things that you don’t want to do. Jason: Since we are on that subject. I got to just ask you a couple of questions about it, and people have asked me this question. They have said I found some ghostwriters online, but they won’t tell me what they have written because it’s confidential. “They might have a confidentiality agreement with the author” they who hire them. And they can’t say, and there is nothing on the book that says who actually wrote it a lot of times. So how do you know if they are any good? Dan: Well, you are absolutely right. Sometimes it is confidential. They are ghost. They are not supposed to be. Dan: That’s why I say I want you to ask if they have worked on your category of book before. And I mean if they can’t tell you that they are not going to tell you, but I had spend a little more time on the phone and ask them how many books they have done. How have the books done? How have the books sold? If they didn’t sell, why didn’t they sell because the publisher didn’t do any promotion, and I will chat him out? You are going to make sure you like the person because you are getting married for a short period of time. Jason: One last question about the ghostwriter how much should someone expect to pay for hiring a ghost? Dan: Well, it’s all over the block and the ones that are more successful charge a lot more money. And I can’t give you a specific figure. I would say its $5000 to $50000. Of course it depends on what they charge for. The first ghost that worked with Lee Iacocca, and the names are on the cover in that case by the way he wasn’t sure the book was going to go anywhere so he want to get paid outright. And I am not sure how much he was paid. May be it was 30 grand or 50 grand or something. Well, the book took off like a homesick angel bad decision. And the second ghostwriter, he wanted a piece of the action. Now, if this is your best book, or you are not the celebrity like Iacocca its not likely you will get ghostwriter two work on your book, but on spec or piece of the action. They want to get paid outright, but there are two ways to go. Jason: What about design Dan? There is two aspects to design. There is the cover design obviously. Then there is the interior design, the layout of the book. Do you hire someone to do that? Do you do yourself, any suggestions on formatting you talked about formatting before? Dan: Yes you do hire somebody. The typesetter is also the designer, but you have to give them guidance because nobody knows your subject as well as you do. Nobody knows your audience as well as you do. So you go to a bookstore, and you look on that shop where your book is going to be, and you find a book that you really like. I mean you like the size, you like the color of the paper, you like the type style, you like the way the chapter start off, it just makes you feel that I mean its just we would like your book to look like that book, buy that book that’s your model. You are going to take that to your typesetter, you are going to take to the printer, and you are going to say I want my book to look like this. They will make a few adjustments and so on, but you are giving them the guidance. They will say nobody knows your audience as well as you do. You know what they want, what they will accept, and somebody has spent a lot of time and money designing that book so you just adapt the design. Jason: Is there any like software that you want to recommend to the listeners other than just typical word you know Microsoft word anything that helps you come up with ideas, anything that — I know they have this for fiction. They have all kinds of software programs, for screenwriters and novels and some things like that. And then anything on may be design if you wanted to do the design yourself. Dan: Well, use Microsoft word, and I do my books, and I have done this since 1981 when I got my first computer. I do my books in what I call page layout format. So in the middle of you are right by 11 sheet you got a column that’s about a four and a quarter wide or about seven long, and by the way in my Writing on Fixing Book it says go to page setup and put in these numbers and then your page will come up just right. But anyway so then you can import your pictures, put in your captions, change the type of phase for your quotations and things like that. You could see exactly what your reader is going to see then when you take it to your typesetter, its already ready trial typeset and you know that you have exactly how many pages you have. And then you can adjust the type size and the type style a little bit to make sure you come out with 144. Now, you also talked about where do you get ideas? The most important thing to do is sufficient research before you write one word. One thing that you do is you get document 116 from my website which is free which shows you how to layout your back cover or sales copy. Its paying by the numbers. It’s also in my several of my books document 116. Do the research. This is a great story. About three months ago I was speaking in Durban, South Africa. A week later, I spoke in Johannesburg. A guy came up to me at the Johannesburg. And he says I was in your class last week in Durban and boy that idea about Amazon that was fabulous. I said, what happened? He said well, you tell me to go and look for books as close to mine as possible, and I did that, and then I started reading the reviews. It was fascinating. I found out what people want, and what they don’t want. I found out what they like and what they don’t like. I found out what to put on my book, and what to leave out. You just can’t do too much research. Find I you know as get as much information possible and that is motivating and then you print out a lot of that stuff, and a lot of those ideas you are going to put it into your book. Jason: Good advice. Let’s may be switch gears to the area of promotion here again. That’s a huge topic obviously and we don’t have time to cover it now. But what are the basics of book promotion? Dan: First of all, all your promotion is going to be doing online. Do not pay for advertising in any respect or in any media, but most of your promotion is going to be done online because eyeballs have moved from print to online. Forget magazines, forget newspapers, don’t send review copies, so it’s not worth it. All of that will be done online, and its very inexpensive, very cheap today, you are going to spend some more time contacting people online. Spend more time online, not less, I am not talking about frivolous time, but you got to do several things a day for your book, and that might be emails and a blog posting, a posting at a forum. A kind of contribution to a website, posting articles, but do at least five of these a day, and promotion takes time. It’s not going to happen overnight, but its so easy today to get the word out on your subject. If you do it online, it’s all computerized, its all internet, it’s all fast, easy and cheap. Jason: What do you think about things like radio, TV, interview report and this, you say no advertising but they really cater to this small self published authors, and they are trying to get their business for getting interviews and so forth to promote their book, and what do you think about radio promotion and things like that in general? Dan: Well, two things if you would like to do radio, the only way to get on radio or television is with the book. And anybody is been interviewed 95% of them have a book. They might be a celebrity, they might be an unknown, but toward the end of the interview up comes the book, so if you want to do this, you got to have a book to get on. Now here is an interesting concept people who read, respond to print. People who listen respond to audio. People who are visual respond to video, so I don’t really feel that YouTube is a good place to promote your book because one is visual and the other is print. You can do things in blogs to promote your book because they are both print. We have different kinds of people. You have people who are home a lot, and they love printed book. You have people who are behind the wheel. They are sales reps, they are long haul truckers, they are long distance commuters. They listened to audio because they are driving. They can’t read a book. I travel; I fly more than 6000 miles every week. I am all over the world. I am out of the country 40% of the time. For years and years I have been reading ebooks. I read a lot of historical fiction. I love reading ebooks. I can’t carry books with me. Sometimes I will download an audio, an audio book and put it into my iPhone, but mostly I’m reading print, and I love to go to a place where I have to stand online for a few minutes because I just whip out my iPhone and continue reading. It’s a gift. So you have to realize that there are different kinds of people, and ebooks don’t replace print books and audio books don’t replace something else. They are going to a different segment of the population. That being said if your book is not available as a print book, and ebook and audio book then for any promotion if you do, you are going to miss some sales because some of those people just can’t consume it. Jason: And any tricks on in terms of like where should they get their book printed? I mean I know pBook is a very important element. You just go to your local printer; Short Run is a thing that in the past 10 years really evolved. I mean you can print one book now. You can print 10 books. What’s the perfect print quantity? Dan: Well, you’ve got three segments there. You got your print on demand which is one book at a time. There are times when you do that, but it’s really expensive. Printing to quantity, again the more you print the lower the print is going to cost up to about 2500 copies to deal with the digital printer. There are 24 of them across the U.S. or across North America. Over 2500, you use a standard offset printer, and there are 42 of them across North America. Now, any printer can print your book, but you want to deal with the book printer. You are going to get price service and quality out of a book printer that’s all they do is one book behind another through gang printing. They are going seven days a week 24 hours a day. The glue doesn’t cool down. Paper is the most expensive part of a printed book, and so these people are buying their paper by the multi-carloads and they are only stocking five or six different types. If you get down to the local printer, any printer can do your book, but he is going to get in one pallet of the paper, and he is going to pay two to three times as much and that is to be passed on to you. And then he really doesn’t know how to do books because he doesn’t do them very often. He likes them because they are a high ticket item, but may be your pages don’t come out in the right order. It’s just not worth fooling around. You want to deal with the specialist. Jason: So I assume you are going to say there is a resource for that on parapub.com right? Dan: Well, all the printers are listed in the back of my books. Dan: And then I have reports on it. And I have got their email addresses so it’s easy to send out the request for quotations, and oh and which is the best printer? The lowest bidder, you use my list, you take the lowest bidder. Everyone is setup a little bit differently. I mean out of those 42 hardcover, I would say 42 offset printers, there is probably only six or seven to do hardcover, and so that’s why you have to send out the RFQ to all of them and see what they do. By the way you also want to ask about ebooks? Dan: Ebooks are the way to the future, but they are not for everybody. Some people won’t audios. Some people want print. They are not going to replace the print book, but ebooks are very exciting. The sales are absolutely skyrocketing, and the best way to get your book into the ebook is to upload it to smashwords.com. They will put it into nine different formats, PDF, LIT, Mobipocket, Palm, ePub, Sony, Kindle and so on. No charge. They put it up with their website. When they sell one, they send you 85%, they keep 15%. So you are paying for performance. They’ve also made deals with Amazon, Apple, Sony, barnesandnoble.com, Google and so on. Not that you have to give away a little more, but you have got the whole ebook market completely covered, and when I came out with that Self Publishing Manual Volume 2. I finished it 6 o’clock at night. It took me 20 minutes I think to upload it to Smashwords, and three more weeks to have it printed, so the ebook came out first. Then later on if you decide that you want to deal directly with Amazon or you want to do something you can opt out, but initially you can’t just beat this. The price is right, and it happens just immediately. You are up online, and about an hour. Jason: So they all take care of your content creation in terms of formatting? Dan: Yeah they will have a style guide or something. For example, you have to take the numbers out of your table of contents because the pages will be different and you have to delete your index because people will use a word search to find what they want. There are certain things that you have to do, to make it compatible, so that their meat grinder can turn it into these nine different formats. Jason: One of the problems with the ebook or the digital version is, is the images tables, pictures, illustrations, I find those are somewhat problematic on my own Kindle. I will tell you that much. Dan: Well, sure and you’ve got a choice. You will just check out the boxes say, I am not going to check off Kindle because I have color photos, but I wanted in ePub and I wanted in PDF, and you go down the list like that. It’s very exciting. The new Apple iPod, well I have seen a lot of those on the airplanes lately. You they are revolutionizing the comic book industry because they are a large format, and their forecolor next it will be the children’s books, and may be coffee table books down string will be some of those, but its going to just absolutely revolutionize the comic book industry because of the large format and the forecolor. Jason: Let’s go back to the old traditional book publishing industry. For a self publisher, Dan if you just want to, if you think it will be a good thing for your promotion, for your bottom line, can you get your books in the bookstore as a self published guy or is that, are you locked out from that unless you have a publisher? Dan: Well absolutely. You know 78% of all the books published are self published. The big publisher is only to 22%. Everybody down the line whether it’s a distributor or wholesaler, or a bookstore, another publisher, they want books that are going to sell. Nobody cares who the publisher is. People buy non-fiction for one or two reasons to learn something or solve a problem. They go into a bookstore, and they see your book on that shelf and they are asking themselves is this book going to answer my question. They might look at the — about the author page, the biography to see if you are a credible person. Nobody ever looks to see who the publisher is. People, the buyer doesn’t know one publisher from another. It’s just not an issue. Jason: But how do you get in? Do you just walk into Barnes & Noble and say hey will you carry my book? Dan: Yeah there are two ways. The best way is to go with the distributor. There are 90 distributors and some are very specialized only computer books, only children’s books some are more general and they focused on six or eight or 10 different categories. You know again they are listed on my book. They are listed on my website. And you want to go to their websites, and just kind of check them out and see how many books they have on your subject. This is important because they have sales reps to go out and visit the stores. Now, business books tend to be sold in downtown stores. Books on parenting relationships tend to be sold out on memorials. So, if you have a book on parenting you don’t want to go with the distributors that only goes to the downtown stores. I mean they are not even going to carry your book along and it’s just the bad match. You want to be matched as closely as possible. They are constantly looking for more product and one of the most important things Jason is that they want to make sure that you are going to promote the book. They don’t want to say well, sure we will get into the stores, but what you are going to do to get customers into the stores, and this means spending time online or letting people know that you have a book, and what it covers and it’s available. I mean it’s not a big deal, but you have to get out there, and promote the book. Jason: Yeah absolutely. So Dan and let’s just close with measuring. I find that in life in general, and I am certain that’s true in the book publishing industry as well some people are kind of wining the game sometimes yet they are not satisfied with the results because they just don’t know how to keep score. I wanted may be you to share some metrics on what might consider as a successful self publisher. How does someone know when they have done a great job of it, or they need to more, or there is a million points in between I understand that. Dan: Well, the most important measurement is you are making money doing this, and I will tell you. I have written 126 books. I have never lost money out a book. Now, you know the number of years ago, I wrote the right book at the right time. Sales took off like a homesick angel, and then I made a move back to California and buy this house on a hill over looking the ocean. I am not going to tell you that if you write a book you can buy a book with an ocean view. Right I have never lost money on a book and you know book is passive income. It’s earning money for you when you are working, when you are not working to even earning for you when you are sleeping. One of the reasons I can spend so much time away from home traveling that speaking is because I have these books that are just earning for me, and my — I put my children to work. Now, another measure are the wonderful letters you get from people all over the world thanking you for your book, your research, your insight for helping them and so many people. Book is a very inexpensive way they distribute once you know. Many of your listeners are consultants, and you know consultant can only talk to a couple of people at one time. Many of them are speakers, and you can only speak to a room full, but your book goes all over the world, and it helps people individually on their schedule. That also brings back more credibility to you and it brings in more speaking business, more consulting business. Many people want to deal with the expert, and by definition the experts are the one that’s who wrote the book, so your book becomes your new business card, so we can measure our success by the amount of money its bringing in, and now the business is bringing in, and the wonderful letters that we got. Jason: Anything on numbers though like the average published book does it sell 5000 copies or 20,000 copies if it’s with a big publisher and then –? Dan: Yeah the average numbers are terrible. I mean the average number is 8500, and you have heard of Harry Potter and so they are the bestsellers obviously there is many books that are selling for a fewer. And we also mentioned the vanity presses earlier if you use the numbers that they publish and you divide the number of titles into the number of books they have sold. They sell less than 100 copies per title, and most of those they sell to the author so that’s another reason not to go that direction. Selling 8500 copies I don’t think it’s very good. And one of the reasons that the big New York publishers don’t sell more than that is they are very reluctant. They hardly ever revise a book because they may be have to start over. And for a professional person, for a professional speaker, for a consultant, our book is the same as our business. And we are constantly improving it. We are constantly collecting information. Every time I go back to the press, we make some changes to it. You know myself publishing manuals in the 16th revised edition, the 22nd printing in 32 years. Its constantly growing, constantly changing, constantly getting better, and you will find that the same people who bought the earlier one are now buying the current one because they know you like you, and they want the latest information. They are the best customers so your book is always getting better, and you are going to sell, you are not going to sell 8500 copies. You are going to sell so many a year, year after year, after year, after year. Jason: Excellent. Well, Dan this is been very, very interesting talking to you. I have been such a fan of your work for so many years now that it’s just great to talk to you in person finally and have you on the show as well. What would you like to say to just to sum it all up? Dan: In summary the most expensive parts of publishing are the mistakes. You don’t have to make them. You know other people who have already done it; it’s a shame when somebody makes a mistake. It’s unforgivable when it happens twice, so get out there, spend time online. Talk to other people, go to conferences, listen to these radio programs, read the books you don’t have to make those mistakes. It’s a lot chapter to do this other things, and you will find that its heck a lot of fun because you are working in your own subject area. Jason: Good stuff. Well, Dan Poynter the self publishing expert. The website is parapub.com, and Dan I got to also thank you not just for being on the show, but your website is a wealth of information. It’s phenomenal, so thank you for your contribution to the industry and for joining us today. Dan: Well, it’s been an honor and pleasure. Thank you, Jason. Introduction: What’s great about the show is you will find on jasonhartman.com is that if you want to learn about some cool new investor software there is a show for that. If you want to learn why Rome fell Hitler rose, and Enron failed there is a show for that. If you want to know about property evaluation technology on the iPhone there is a show for that. And if you would like to know how to make millions with mobile home, there is even a show for that. Yeah there is a show for just about anything only from jasonhartman.com or type in Jason Hartman in the iTune store. Copyright by Hartman Media Company. For publication rights and interviews please email [email protected] This show offers very general information. Opinions of guest are their own. Nothing contained herein should be considered personalized, personal financial investment legal or tax advice. Every investor, strategy and goals are unique. You should consult with a license, real estate broker, or agent, or other licensed investment, or and or legal advisor before relying on any information contained herein. Information is not guaranteed. Please call 714-820-4200 and visit www.jasonhartman.com for additional disclaimers, disclosures and questions (Top image: Flickr | aplumb).